DID YOU GET YOUR CALL YET? "The use of loaded questions in a supposedly objective telephone opinion poll during a political campaign in order to bias voters against an opposing candidate." One evening this week my friend received a telephone call from a "marketing company" doing a little political survey and asked her to participate. With more than a little trepidation she agreed and took copious notes as the interrogation proceeded. I'm going to give you the best sense of how the poll was presented based on my correspondence and conversations with her. "Do you consider yourself a conservative, liberal or independent?" "Do you intend to vote in November, 2014?" "Is the current city council going in the right direction or on the wrong track?" 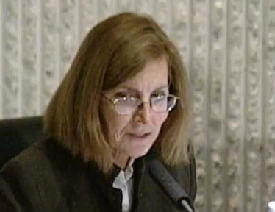 "Rate the following, ranging from "very unfavorably" to "very favorably"
Sue Lester, operated a medical marijuana dispensary and served on the 60th anniversary party committee. "Which 2 would you consider voting for"
The final question asked something about the current city council dividing the community. And, at the very end, my friend was asked her Ethnicity. When she responded "white, Caucasian" she was further interrogated, following up to affirm she was "non-Latino". She was asked if the primary language spoken in the household was Spanish. 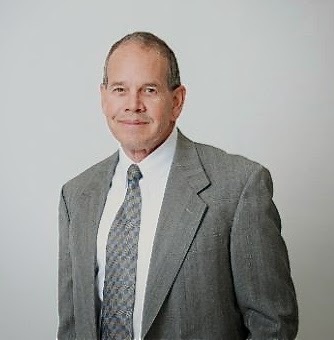 It's interesting that Tony Capitelli, the first person to announce his candidacy for Costa Mesa city council this season, was not part of the selection choices. And, according to my friend, the questions were framed in a way that seemed to favor Righeimer. Thursday night I joined more than 130 interested residents at the Neighborhood Community Center for a workshop on Banning Ranch conducted by the folks at the Banning Ranch Conservancy. The room was packed and the audience was very focused on the issue. 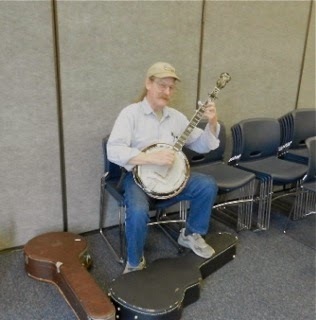 I was surprised and amused to find the irrepressible Terry Koken sitting inside the Victoria Room, plinking away on his banjo, waiting to greet me. No, he did not play for us. I arrived early to find Barry Friedland setting up his cameras to cover the event. Old Barry does an excellent job of providing coverage of many important meetings around town for replay on his Costa Mesa Brief YouTube channel. Look for the coverage of this meeting soon. 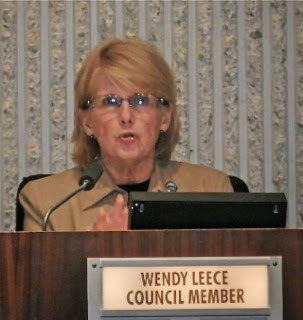 Costa Mesa councilwomen Sandra Genis and Wendy Leece attended, as did former councilman Jay Humphrey and current Parks and Recreation Commissioner Bob Graham, although he left very early in the meeting. I also saw council candidate Tony Capitelli in the audience for a few minutes. I saw no city staff members in the audience, nor were members of the Newport Banning Ranch development group represented as speakers. This was a one-sided affair - to stop the development of Banning Ranch. The meeting, which began late, was moderated by the president of the Conservancy, Dr. Terry Welsh, who launched into the reason for the meeting - to educate the public and to get help with the project. 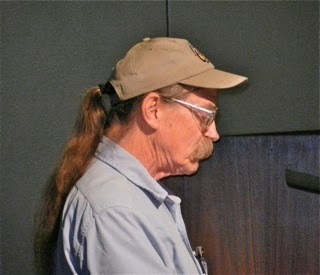 Following his introduction he passed the commentary to various members of the board of the Banning Ranch Conservancy and others to discuss different topics. Suzanne Forester spoke twice, hitting up the crowd for contributions and emphasizing the need to reach $25,000 in contributions by the end of the month so an anonymous generous benefactor would pony up his guarantee to match that amount. Several others spoke, including Terry Koken, who filled in for an absent speaker and joked his way through an unfamiliar slide show. He actually did a pretty darn good job considering that he was drafted for the task just moments before. Among the other speakers was resident Kim Hendricks, who spoke on Fairview Park because of the synergy between that venue and the Banning Ranch. She emphasized the current discussions taking place by the Fairview Park Citizens Advisory Committee and what she described as plans to develop Fairview Park. 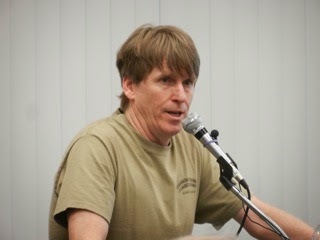 Steve Ray, Executive Director of the Banning Ranch Conservancy and host of a Saturday morning radio show on KOCI-FM 105.1, spent a good deal of time explaining the current status of the plans to develop Banning Ranch and the status of the lawsuit filed by the Conservancy to halt the development. We learned that the plans to develop the ranch, while slowed, still move forward. We learned that virtually ALL the traffic generated by the project will end up on Costa Mesa streets. We learned that the development agreement agreed to by the City of Costa Mesa won't come close to covering the mitigation costs for that traffic. We also learned that the Newport Banning Ranch development project may take as long as 15-18 years to complete once begun due to the need to mitigate oil field residue. 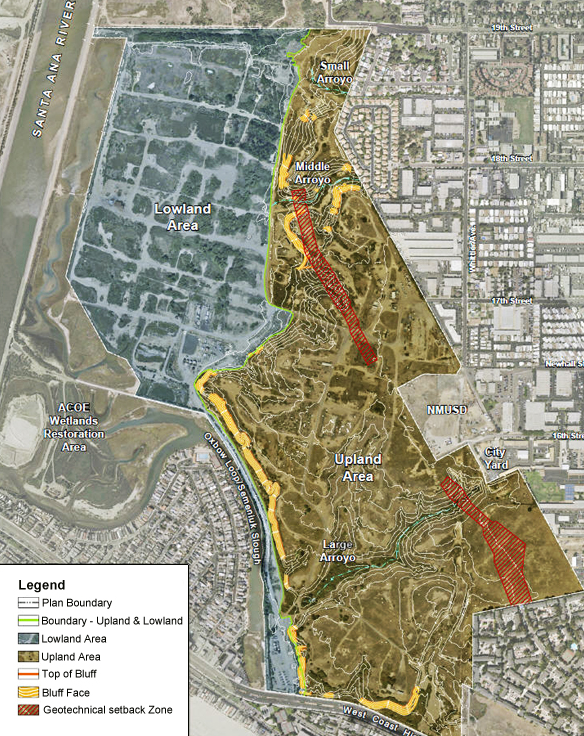 We learned that, while the neighboring Sunset Ridge Park project involves moving 50,000 cubic yards of dirt, the Banning Ranch project is projected to move 2.6 million cubic yards! 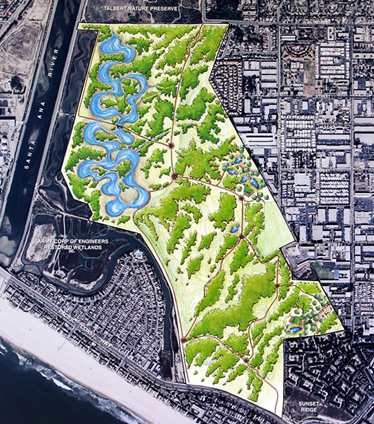 We learned that the City of Newport Beach was stymied on the project because it conflicted with their General Plan, so they just set about amending the General Plan to accommodate the development of this site. You can learn much more by visiting the web site for the Banning Ranch Conservancy, HERE. 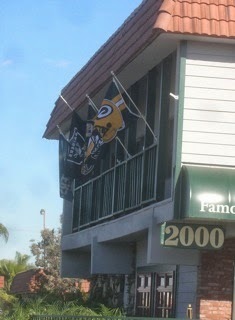 You can contact Welsh at 714-719-2148 or Ray at 310-961-7610. 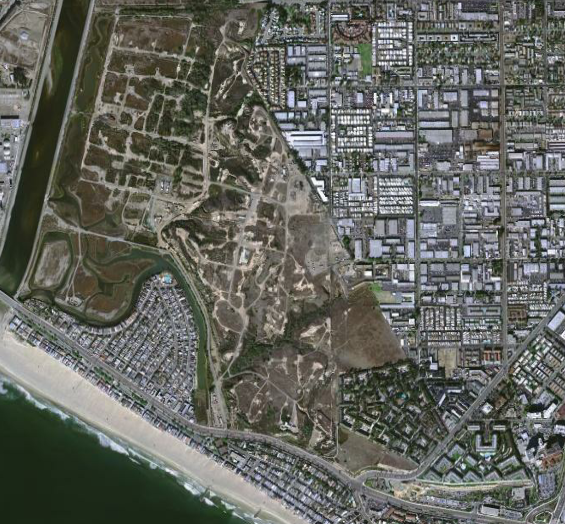 They can tell you about their plans for the proposed Banning Ranch Park and Preserve, shown below. 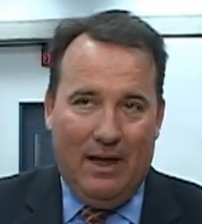 According to informed sources, and verified by Daily Pilot reporter Bradley Zint in an article late this afternoon, HERE, private investigator Chris Lanzillo exercised his right against self-incrimination today when he "took the 5th" more than 200 times during a deposition that is part of a lawsuit filed by Costa Mesa Mayor Jim Righeimer, his wife, Ilene and Mayor Pro Tem Steve Mensinger springing from events that occurred more than 18 months ago. You will recall that, according to some contemporaneous news reports at the time, Lanzillo was in councilman Gary Monahan's bar, Skosh Monahan's, with a female associate apparently attempting to lure Monahan into some kind of compromising situation with her. Both Righeimer and Mensinger were also in the bar and, when Lanzillo saw Righeimer leave, he followed him and called the Costa Mesa Police Department to report him as a probable drunk driver. 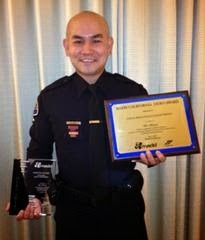 After reporting the incident Lanzillo apparently followed Righeimer home and waited nearby in his car while a member of the CMPD - Officer Kha Bao, as it turns out, who is the CMPD's most highly-decorated DUI officer - arrived to inquire of Righeimer. According to reports, Bao asked Righeimer to step outside, did a quick horizontal gaze nystagmus test and, based on his experience with hundreds of drunk drivers, determined Righeimer was not, in fact, impaired and left. You can read about that kind of test at the link above. This is only one of several so-called "field sobriety" tests used and can be used to quickly affirm that the driver is NOT impaired. Righeimer was NOT asked to stand on one foot nor was he required to do the "walk and turn" test. And, he was not administered a breathalyzer. According to reports, Righeimer's wife observed Lanzillo in his car and approached him, at which time he drove off. Some reports indicate that he "attempted to run over her" - obviously not true or Officer Bao would have arrested him for assault with a deadly weapon. So, now the drama continues. Lanzillo, just as you and I do, had every right to exercise his constitutionally-guaranteed protection against self-incrimination. Of course, as we've seen from this council majority, the rights of others don't mean much to them. You can read the quotes from the various lawyers in Zint's article. There is no word at this time as to the next step in this drama. I expect there will be other maneuverings by both sides as they work their way through the legal obstacle course. We've been led to believe that there is a deadline imposed by the judge in the case of next Monday for more legal action. We know that Righeimer expects to be able to be involved in the negotiations of the CMPOA contract because he said that from the dais not too long ago. 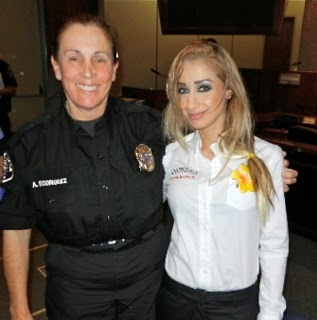 However, even if the CMPOA is removed from the lawsuit, both he and Mensinger have demonstrated clear bias against the men and women of the Costa Mesa Police Department and, in my non-legal opinion, should be barred from participating in any way. 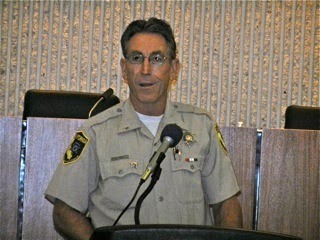 Wednesday evening the Costa Mesa Police Department hosted approximately 40 residents in City Council Chambers for a very informative presentation by Lieutenant Kent Smirl of the California Department of Fish and Wildlife on the subject of Urban Coyotes. 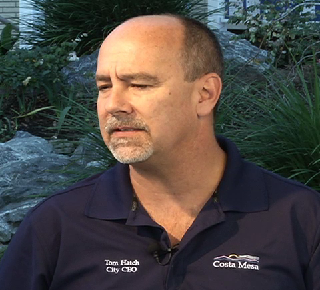 He was joined by Costa Mesa Police Sergeant Bryan Wadkins. CMPD Public Information Officer Lieutenant Greg Scott and Chief Tom Gazsi, plus Animal Control Officers Anna Rodriquez and Art Beames, were also present. There have only been 21 attacks by coyotes on humans in the past 7 years. During the same period there have been 4.5 million dog bites and 31 people killed by dogs. The best way to deter coyotes from invading our neighborhoods is to deny them the "Big 3" - Food, Water and Shelter. If you encounter a coyote, "haze it" - make yourself as tall and loud as possible. Typically, the coyote will run. Encourage your entire neighborhood to discourage coyotes. Spread the word. Don't feed feral cats. It's against the law and they are a food source for coyotes. Don't feed raccoons, possums or skunks. They are a food source for coyotes. Don't feed coyotes. When you do its signing it's death warrant. Coyotes may not be trapped and released elsewhere. Coyotes prefer domestic pets because they are easier to obtain. Coyotes can easily leap a 6 foot fence. Coyotes WILL enter a doggie door, following the scent of your pet. Many residents shared personal stories of encounters with coyotes in our city. Sergeant Wadkins told us that the CMPD will NOT respond to a coyote sighting unless there is an eminent danger to the public. The animal control officers will not attempt to trap and remove a coyote. To reach the Animal Control officers call 715-754-5311 and leave a message or call the CMPD non-emergency line at 714-754-5252 for Dispatch. As always, if there is eminent danger call 911. One speaker suggested that the best solution was a Collective Community approach - where everyone in the community understands what to do about attractants that lure coyotes into our neighborhoods and agree to band together to eliminate those attractants. 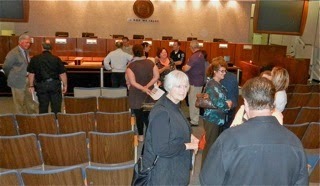 Following the meeting many members of the crowd lingered to speak with Smirl and Wadkins. This was only the most recent effort on the part of the CMPD to educate the residents about the issue of urban coyotes. HERE is an excellent piece created by Scott last year from the City's website. In addition, take a look at this excellent video clip by Costa Mesa Crime Prevention Specialist Kelly Vucinic on the subject. In a very interesting article behind the pay wall of the Orange County Register today, HERE, titled "Mission Viejo gets creative to fill vacant deputy spots", Staff Writer Brooke Edwards Staggs presents a disturbing view of what can happen when the Orange County Sheriff's Department provides law enforcement under contract to a municipality. Read it if you can. Retirements and promotions have left many contract cities with an unusually high number of vacant deputy positions. Mission Viejo has had as many as eight or 10 of its 47 patrol positions vacant at one time because of retirements throughout the county and local deputies being promoted to fill those positions. 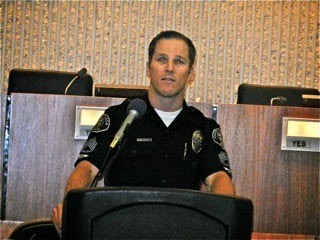 In the article Mission Viejo Police Chief Brad NewMyer indicated that working excessive overtime to cover shifts can lead to injuries, illness and mistakes on the job. By trying to cover shifts with officers from outside Mission Viejo, unfamiliar with the terrain and streets, response times have increased. 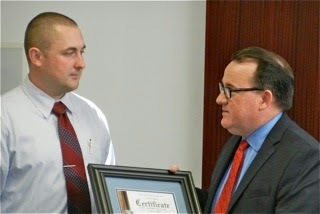 Sheriff's Department trainees are typically assigned to Jail duty following graduation until there is an opening on a patrol beat, when they are teamed up with another officer for a five-month tour as a trainee. They cannot work alone during that time. All but one of their vacant deputy positions is assigned to a current trainee. Without fully trained officers shifts must be covered by overtime. Mission Viejo plans to add two new trainee positions to pretrain deputies to be ready for anticipated vacancies. It will cost $103,830 for the remainder of the fiscal year. Apparently Mission Viejo was reimbursed $700,000 by the Sheriff's Department last year because of vacancies. 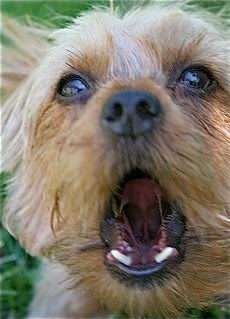 Some local politicians and their yapping Pit Yorkie sycophants have been screeching for the Orange County Sheriff's Department to take over law enforcement in Costa Mesa because our staffing levels are approaching dangerously low levels. If those politicians had listened to their own consultants, Management Partners, and/or former Interim Chief Steve Staveley and allowed the authorized staffing levels to be more appropriate for a city the size and complexity of Costa Mesa we likely would not be in this fix. If those politicians had allowed Chief Tom Gazsi to begin recruiting for anticipated vacancies when he wanted to instead of stiff-arming him for more than a year we might not find ourselves in this situation. At the last City Council meeting Chief Executive Officer Tom Hatch mentioned a "plan" to help resolve the staffing issues in the CMPD and we were told that he and Chief Gazsi would be working on it. It will be very interesting to see what kind of plan results. In the meantime, the men and women of the CMPD continue to work long shifts to keep our streets safe. 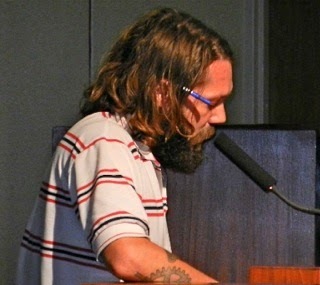 The Costa Mesa City Council meeting Tuesday night, as always, presented some interesting moments. I thought we might have an early evening - maybe even getting out of there by 8 p.m. or so. HA! HA, I say! Silly me! (Rear: Kevin Tobin, Andrew Smith, Ron Amburgey, Sawyer Pendleton, Mike Decker. Kirk Bauermeister, Yolanda Summerhill, Lee Ramos, Kimberly Hall Barlow, Gene Hutchins. The evening began with a short reception for the members of the Charter Committee in Conference Room 1A. 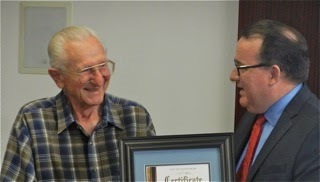 Mayor Jim Righeimer, using his best stand-up routine, presented each member in attendance with a certificate thanking them for their participation. I've included a few shots that turned out from my vantage point in the back of the room. 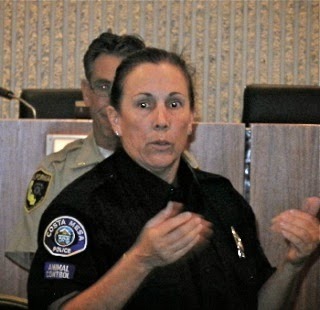 Then I scampered into the council chambers just as the meeting was moved to Conference Room 5A for a Closed Session for labor negotiations with the Costa Mesa Police Officers Association. 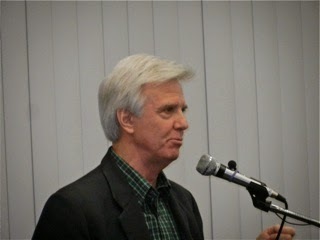 As it turned out, since Righeimer and Mayor Pro Tem Steve Mensinger must recuse themselves because of their bogus lawsuit against the men and women of the CMPD, and council member Gary Monahan was a no-show, the meeting was first trailed to the end of the regular meeting, then cancelled altogether. I know Monday was St. Patrick's Day and we all know that Monahan's pub was really humming, but he still has a responsibility to the city. Seems that he manages to forget that around this time each year. 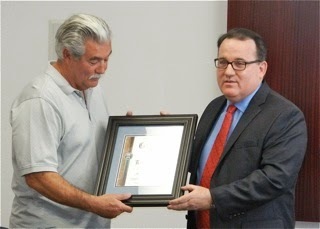 The regular meeting began as scheduled with a nice presentation to and by Werner Escher of South Coast Plaza. 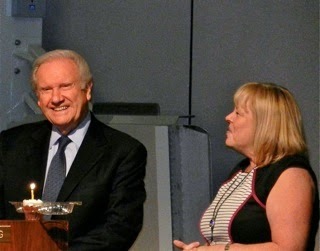 Executive Assistant to CEO Tom Hatch, Kelly Shelton, presented Escher with a birthday cupcake to celebrate his 83rd birthday and the audience sang Happy Birthday to him. 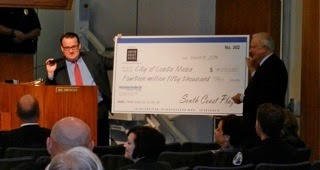 He, in turn, presented a facsimile check for more than $14 million, which represented the amount of sales tax revenue South Coast Plaza generated for our city last year. During his comments Escher said it's looking even better this year. That amount represents just about 14% of our General Fund revenue. Public Comments were, as always, an adventure. The first 10 of 13 cards were read and off we went. 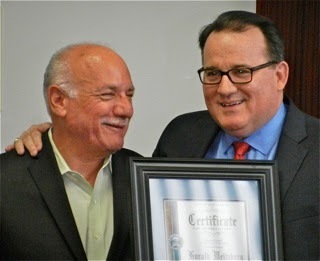 It began with the irrepressible Terry Koken - after presenting a check to Police Chief Tom Gazsi for safe transmittal to the Orange County Model Engineers - speaking the mayor, referring to the lawsuit, and suggesting that he might be in need of psychiatric help, or maybe a frontal lobotomy. 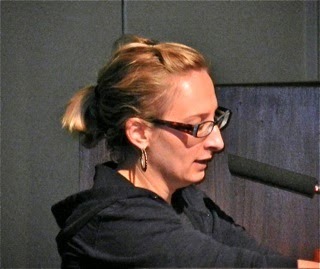 Eastside resident Lisa Morlan, whom Righeimer recently appointed to his Preserve Our Neighborhoods Task Force, (which he mis-identified as the Neighborhood Improvement Task Force) stepped up and demanded to know why citations issued to some Group Homes had been dismissed, and showed some charts with statistics verifying the fact. She waived a pseudo-traffic ticket and wondered - looking at Chief Gazsi in the audience - if she might get IT fixed. She also suggested that the Task Force of 5 men and 2 women was a little off-balance and suggested that a few more women be appointed - preferably some who live near group homes. 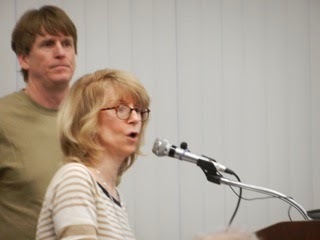 Debbie Koken addressed the Banning Ranch Conservancy Town Hall Thursday evening at the Neighborhood Community Center, 6:30 - 8:00 p.m., where the community will be updated on that piece of land. Greg Thunnel chided the council for missteps beginning two years ago which, he postulated, have led to our unfortunate circumstance today. James Bridges, who has been shut-out of the early edition of Public Comments for several meetings, said he felt like he'd won the lottery, then reminded the council that the meetings are for the people, not the council. 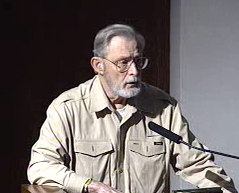 Flo Martin, a 47-year resident, gave the police department a tip of the hat, gesturing to Gazsi in the audience. Al Melone, former council candidate and dog lover, suggested we try to recruit cops from out of state - from cold confines. His logic is that our temperate climate will help attract good candidates. Bill Burke thanked the council in advance for paving his streets, since he's off to Tibet for a little hike later this month. Chris McEvoy addressed Fairview Park and Westside development and the impact on residents with added parking issues and traffic. 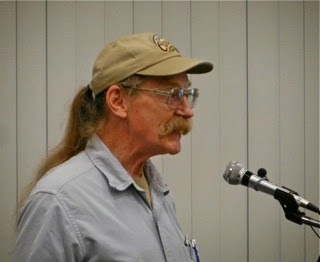 He was the last speaker - the final card drawn was for Jay Humphrey, but he declined to speak. Of course, the mayor didn't permit another speaker to step up - he just moved right to Council Member Comments - and the remaining three speakers were trailed to the very end of the meeting. Sandra Genis addressed Eagle Scout Christian Redman's project in Fairview Park last weekend where he and volunteers planted new foliage in a specific area during a blazing hot day. She wondered about Righeimer's Preserve Our Neighborhoods Task Force, and whether it was governed by the Brown Act and how much staff time would be taken to support it. When he spoke Righeimer addressed the group home issue briefly, addressed his task force and the $7 million in capitol improvements being planned. He also told us he took a tour of industrial businesses with John Hawley, who owns Railmakers on the Westside. Righeimer actually seemed amazed that we had such an eclectic mix of businesses over there. Where the heck has he been for his short tenure in the city?! It was almost like one of those Huell Howser "Gawllee, Louie!" moments. Mensinger had not much to say at all. 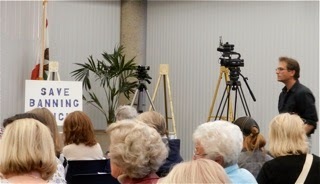 It was Hatch's turn and he briefly addressed the Task Force, indicating it will be handled much the same way Leece's Town Halls had been handled over the past couple years. He then turned the meeting over to Director of Public Services Ernesto Munoz, who provided a fifteen minute report on several items from the Consent Calendar that involved spending $6.6 million on street work. Hatch then continued by telling us that the staff is getting close to completion of the Ethics Policy, which will then be passed on to the Finance Committee for review. 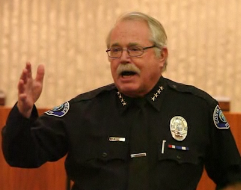 He praised the six Costa Mesa Police Officers who recently received the MADD Century awards. Unfortunately, he mis-identified the only woman officer in the group. He spoke of the police staffing issue and said he'd sent an email to Chief Gazsi that day addressing some temporary solutions, and that the recruitment team is working aggressively to hire more police officers. Then Interim Finance Director Steve Dunivent walked us through the new program of renewing business licenses online - a first step to being able to apply for and renew them online. In response to an inquiry we learned that currently the City has 9,762 active business licenses but 11,442 on the books in total. Righeimer suggested somehow tapping into the Board of Equalization records to ferret out businesses that are operating without a license. Now came the Consent Calendar and I had high hopes that, since Munoz gave a comprehensive report on about half the items, we might make it through with none being pulled. Humphrey asked that, since Munoz report was so clear in folks minds, any of those items pulled be addressed immediately instead of being trailed. Righeimer said it looked like a short meeting so they'd handle them all immediately - then changed his mind when several others were pulled. 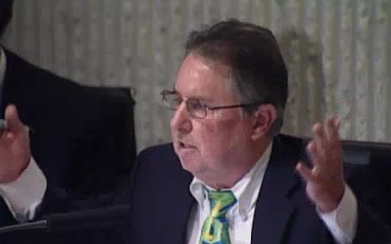 That action requires a concurrence of the other council members, but he just ignores the rules. So, instead of 75 people hearing those issues, only a dozen who were left in the auditorium at the end had the advantage of hearing about them. And, once again, people had their opportunity to address grievances stifled. Old Business #1 was the second reading of the Small Lot Ordinance, the discussion of which began at 7:48 p.m. Then, after an hour of discussion and public comments, the item was continued because it looked like it would be a 2-2 vote (Monahan was still absent). Ties mean an issue fails. No date was set for the next hearing. A little past 9 p.m. the Consent Calendar trailed items were heard. Anna Vrska used #3, the Warrants, as a platform to address Righeimer's behavior, citing the Benito Acosta ruling which found part of our Municipal Code to be unconstitutional. She didn't finish, so completed her comments during the trailed public comments segment. She basically told Righeimer that his behavior could lead to yet another lawsuit. 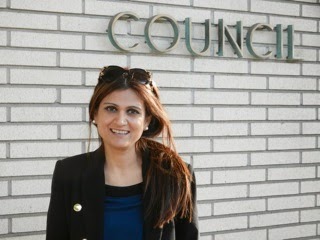 During the trailed Public Comments segment Assembly candidate Anila Ali addressed the council, introduced herself and her candidacy. She had turned in the very first speakers card at 5 p.m. and got shuffled to the back of the line, but stuck around anyhow. 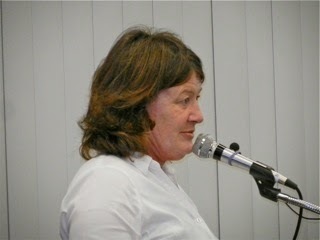 Gay Royer told the council of abuse an elderly, ill neighbor had at the hands of the Code Enforcement folks. After hearing the story Righeimer suggested that we had a fund to help folks like him. Leece and Genis indicated they'd never heard of it, and asked for a report. The meeting was adjourned at 9:45 in memory of my friend, David Stiller. It was a lovely gesture for a man who had given so much to the city in the form of volunteer hours on committees and commissions.